Figure 1. Stripe rust spores on a wheat leaf, being collected for research. The University of Wisconsin Field Crops Pathology team has completed leaf disease ratings at all Wisconsin winter wheat variety trials this week. We will begin rating for Fusarium head blight (FHB) damage in these same trials next week. We have also scouted wheat in production fields in various areas. Most wheat has completed anthesis and is filling grain. No FHB has been observed up to this point. 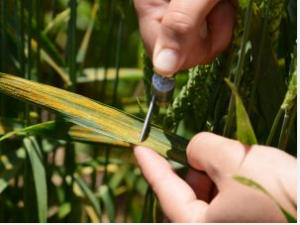 However, stripe rust is pretty serious in most locations we have been (Figure 1). On susceptible varieties that haven’t been sprayed with a fungicide, we have observed 100% incidence with average severity on flag leaves ranging between 30 and 90%! 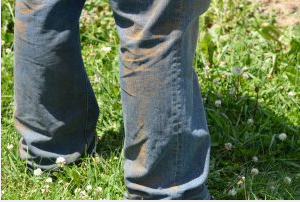 We even have our token “Yellow Jeans” picture to demonstrate how severe stripe rust is in some fields (Figure 2). 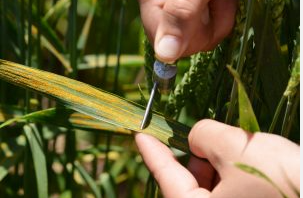 While there are many cases of severe stripe rust, we have observed some varieties to be very resistant. Little or no rust observed (Figure 3). I think there will be a wide range in yields of winter wheat this year in Wisconsin, based on stripe rust severity. Those who did not spray fungicide and have susceptibility will see significant yield losses and reduced test weight. We have seen very few other foliar diseases on wheat during our travels. Leaf blotch diseases are present in some fields in the lower canopy, but in many cases, stripe rust is out-competing those diseases. We found powdery mildew in one isolated location in one field we have been in. We suspect that we will find some FHB over the next several weeks as portions of the state had favorable weather for the FHB fungus during anthesis. We will continue to monitor this situation and alert you to what we find. Figure 3. 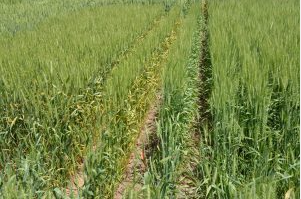 A stripe rust susceptible winter wheat variety on the left and a resistant winter wheat variety on the right. Note the yellow leaves on the variety on the left. Finally, I want to note that fungicide applications should not be made after the anthesis period. Most fungicide will no longer be effective on these diseases once established. Also, the pre-harvest intervals on these products will not allow application after the anthesis period.